Nvidia recently unveiled its Tegra K1, dubbed ‘super chip’, consisting of 192 Cores. Much has been said about it, but we had no point of reference so far. 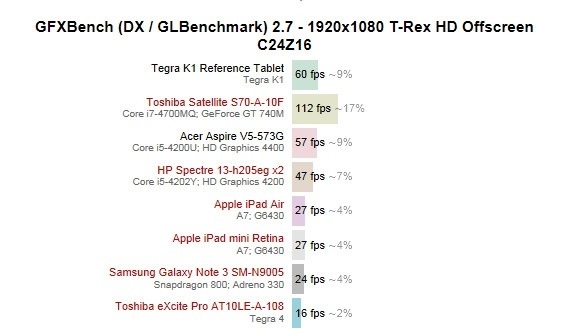 Well benchmarks have finally surfaced on Nvidia’s Tegra K1 Flagship. Initial benchmarks are quite promising and show a major leap over the last generation Tegra. 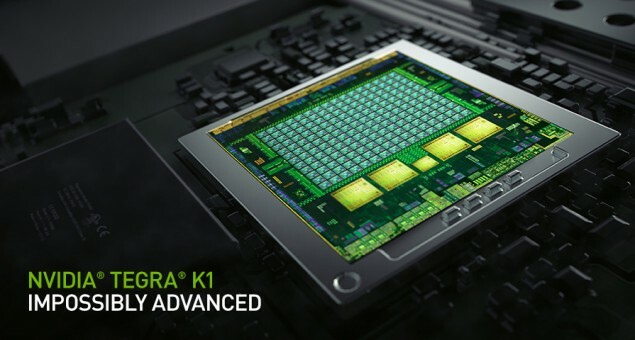 Nvidia Tegra K1 Benchmarked – 3.75 Times faster than the Tegra 4 and Leads the Tablet Charts, Holds its own against Notebooks. We finally get some insight on where exactly Tegra K1 stands on the performance charts. Fluff words aside, the results seem very promising with Tegra K1 Leading in the Tablets Charts and even Holding its own in the Notebook sector! Infact it seems to be faster than just about every low power iGPU and even some dGPUs. The first dGPU (only mobile dGPUs tested of course) to beat the Tegra K1 was used for reference purposes. As you can see the only device included in the bench to beat the Tegra K1 chip was Nvidia’s own GT 740M; and seeing this is a full fledged dGPU with 45W TDP it doesn’t mean much. However for the target niche the Tegra K1 was actually created; it leads with a major gap. Scoring a rock solid 60fps in an off screen 1080p Benchmark it fares significantly better than the Tegra 4. The predecessor to this chip can only manage a measly 16fps so you can see for yourself how great a difference this is. Infact the only devices that come close to the Tegra K1 are notebooks equipped with an Intel HD iGPU. The closest tablet tested is the iPad Air which manages a barely acceptable 27 fps (still not gaming standard) on the demanding 1080p res. From these initial tests it seems that the Tegra K1 will actually be able to deliver on a intensive gaming experience in a hand held device, not to mention in cars.